"Inevitably there are repairs and other emergencies that take a chunk out of the budget"
Do you track your spending and use a budget? Whether preparing to RV or already traveling on the road, a budget is a useful tool. It will help you decide if RVing is feasible and also help you stick to your spending plan while traveling. 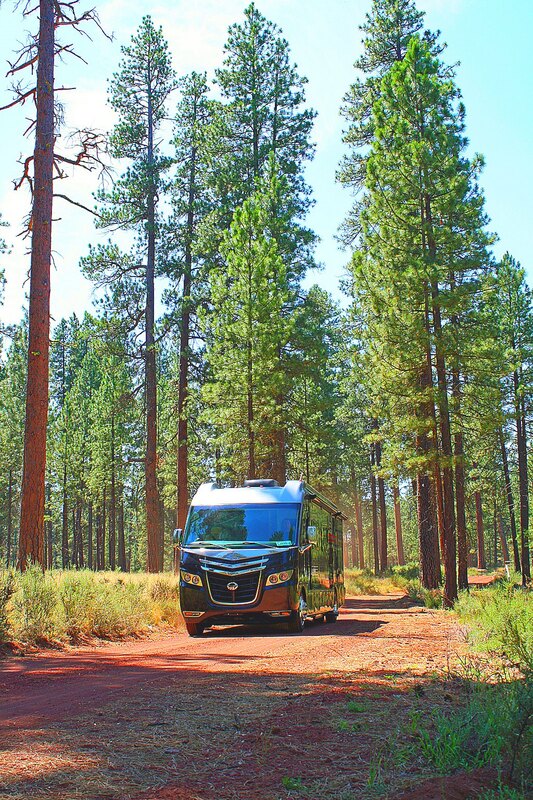 Can you afford to full-time RV or even snowbird? Completing an RVing budget, while not exact, will help you make realistic choices. If you do not have an RV yet, you can get a rough estimate of fuel by using 6 mpg for motorhomes; up to 10 for a diesel motor. The main insurance companies that provide insurance for full-time RVers will give you instant quotes or an overnight quote at their Web site to use as a ballpark figure. And you can use camping directories to get a rough idea of campground costs. It seems like campgrounds are charging an average of $25-30 a night, though you can certainly pay more. You can also use discount and membership camping to decrease your costs. The domicile you choose will also impact your budget. Your domicile is your tax home. If you travel full-time, you can choose a domicile more to your advantage. Taxes, insurance and vehicle registration can vary immensely from state to state so this is an important decision. 1. Housing or RV park costs: If you find yourself spending too much, you can stay in less expensive RV parks and stay in a water/electric site rather than one with full hookups. You can park overnight in a Wal-Mart parking lot where allowed. Boondocking (camping without hookups) on public lands or rest areas, where allowed, can be free. Many RV parks offer discounts for long-term stays. Stay for a week or month in one location and not only do you get a discount but you save on fuel costs too. 2. Propane: Adding a more efficient catalytic or ceramic heater to your RV and using that instead of the installed heater saves on propane costs. 3. Food: Food costs can be controlled by eating out less frequently and in your food choices. 4. Other purchases: Purchases are usually fewer because of space considerations. Some RVers stop exchanging gifts with family members or reduce what they spend. Unique items from your travels make nice gifts that don’t have to cost much. Or, family may appreciate frequent postcards or phone calls in lieu of gifts. With a more casual lifestyle, jeans/shorts and t-shirts are suitable for most occasions. Inevitably there are repairs and other emergencies that take a chunk out of the budget. If possible, have a rainy day fund or spend a little less than the allotted amount and put that aside. A roadside assistance program comes with a monthly fee, but more than pays for itself if you need to be towed or a tire changed when far from civilization. Read the fine print to make sure it covers such eventualities. Set aside money for rig replacement too or for when you can no longer travel. Develop a method for tracking spending. A spreadsheet on your computer is a good way to keep track and analyze your data. You can set up your spreadsheet by category and then sort to get totals for each one. Tracking your spending will bring some insights. We don’t think of the little amounts like stamps and laundry and Starbucks. For example, when you see your cell phone and Internet access totals each month, it may prompt you to see if you can reduce that expense - or not. Since spending is all about choices, you can see if your spending is matching your values. Keeping in touch, for example, may be high on your list of priorities while eating out could be low. You can more easily make adjustments when you know where the money is currently going. One method that has worked for me to stay within spending limits in each category is the envelope method. This tool is recommended by Dave Ramsey, creator of Financial Peace University http://www.daveramsey.com/ Cash for each budget category goes in an envelope so you can visually see what is there. When that envelope is empty, you have spent your allotment for that month. Knowing you can easily adjust your spending in several categories helps stay within your budget. If your outgo exceeds your income, then it could be time to find ways to add to your income. Workamping (working on the road) or volunteering can bring in extra cash or effectively give you more money by providing a free RV site. Some RVers work part of the year; others work until they build up a certain amount of money; and still others settle down in an RV or mobile home park for awhile and get “real jobs” outside the park. Working and volunteering gives you even more flexibility. Often you get free “perks” when working like free admissions to area attractions and discounts on laundry or propane. Since you are not traveling all the time, fuel consumption goes down too. And having time to get to know an area and explore at your leisure gives depth to your travels. Unless you stay in expensive RV resorts and eat out at fancy restaurants, life on the road is generally much less expensive than staying in a house or apartment. It is also much easier to adjust your spending to stretch your dollars. RVing is a life full of new experiences and adventures. Use a budget and tracking your spending as tools to get the most out of your travels.